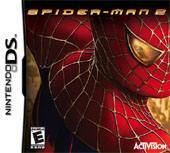 Spider-man 2 is one of the first generation of games for the new Nintendo DS and not only have Activision shown what the console is capable of, but it's easily one the most impressive release games for the system itself. 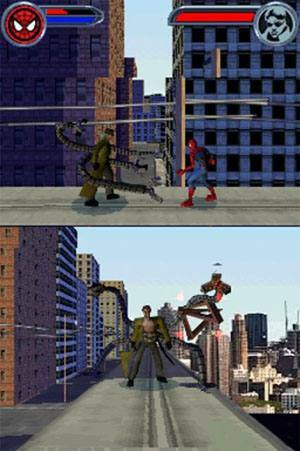 The story is loosely based on the second movie of the franchise (Spider-man 2) and after Peter Parker has been Spider-Man for just under two years, he soon learns that it's not easy being a superhero and to make matters worse, New York is overrun with thugs who are led by the criminal mastermind, Doc Ock. 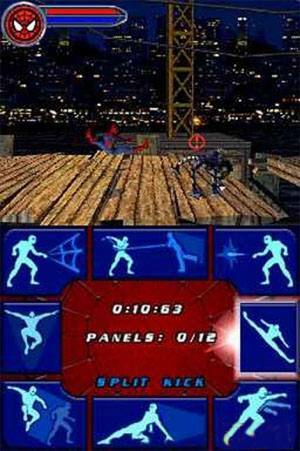 As with all Nintendo DS games, Spider-man 2 makes full use of the dual screens on the console with the top screen used to display the action in the gaming environment and the bottom screen used to control spidey. The gameplay of Spider-man 2 is relatively straightforward, especially if you've played the edition for PS2 or XBox. The game has a very easy first level where you have to save people from a burning building. You use your spider-web making abilities to dash around, as well as using your spider ability to walk on walls and ceilings to avoid thugs and fire. Once you save all the people in the building, you return to the start and take on the next mission. Many of the other levels in the game are similar to this one, and some offer up some interesting mini games that involve players using the bottom screen and the Nintendo DS stylus pen (a true innovation in gaming). The more professional gamer should finish this game in around 20 hours because as with all good console games, the save system only allows you to save once you have successfully completed the level. However, with that said, Spider-man 2 is a rather difficult game (even on easy) as the enemy gets harder with health being rather sparse. Graphically, Spider-man 2 is easily the most impressive looking game of all the launch titles on the Nintendo DS and will be adored by all gamers who love traditional 3D arcade games. The most impressive feature of the graphics is the level of detail with the fluid motion with all the characters in the game. It's almost a combination of 2D characters running around in a 3D world, but there's no denying that the graphics are amongst the best on hand-held devices at this time. The colours and contrast of the environments all are amazing and look great on the new gaming platform. The only downside to Spider-man 2 is the sound effects sometimes become a little repetitive but fortunately this is not integral to the game. However, with that said, I must admit that the developers have done a great job with all the different sounds and music on the Nintendo DS. Throughout the game there are voice clips from Toby Maguire and various bit-part actors. During a mission within a burning building you can use the positional audio to home in on the people trapped in the fire so that you can rescue them. In conclusion, Spider-man 2 DS is a very in-depth game that contains some amazing graphics and a very sturdy and playable gaming engine that I would recommend to all lovers of the arcade genre. The game is not easy, so you will definitely get value for money and if you are looking for a game to purchase with the Nintendo DS, than Spider-man 2 is the one to get. Check it out!